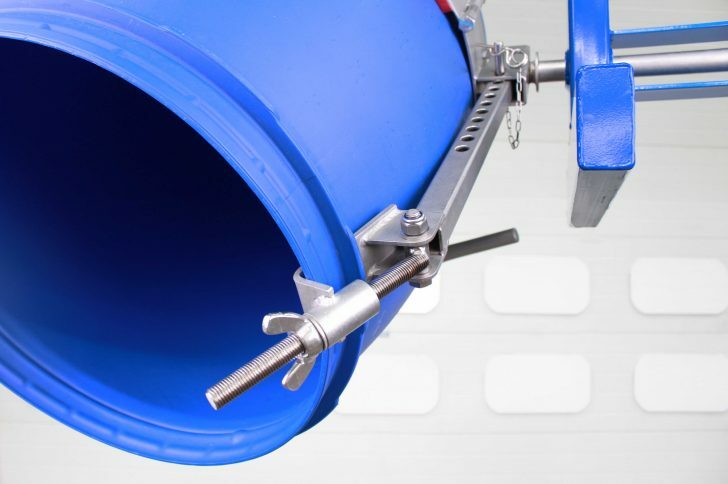 The fixed band variant of our Overhead Drum Rotator utilises a stainless steel over-centre clamping band. 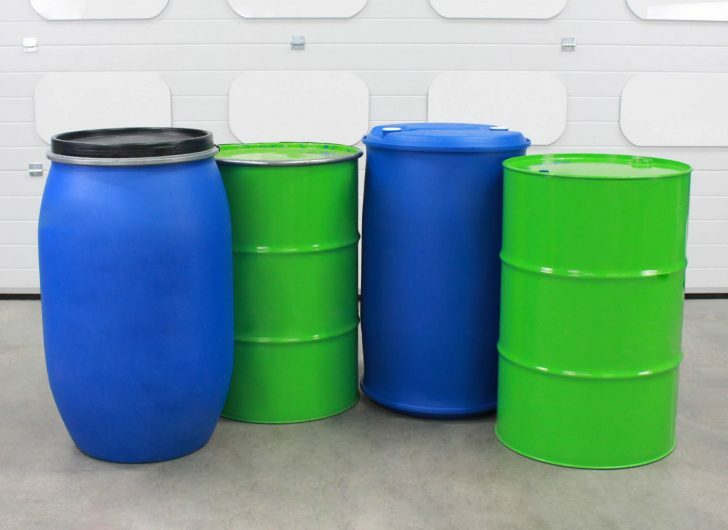 Drums from 200- to 220-litres both steel and plastic can be decanted efficiently. 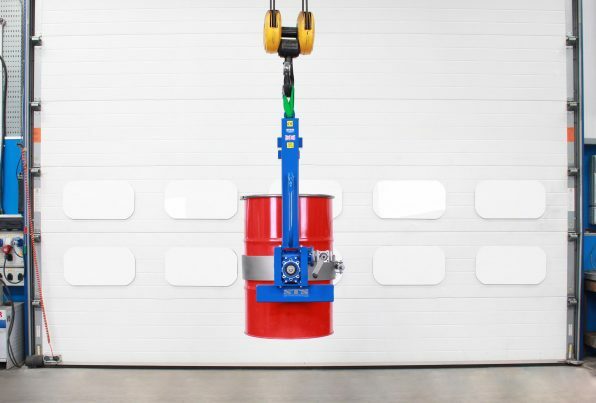 Operators simply connect the drum, hoist it up and then turn the rotation handle to empty the drum contents. 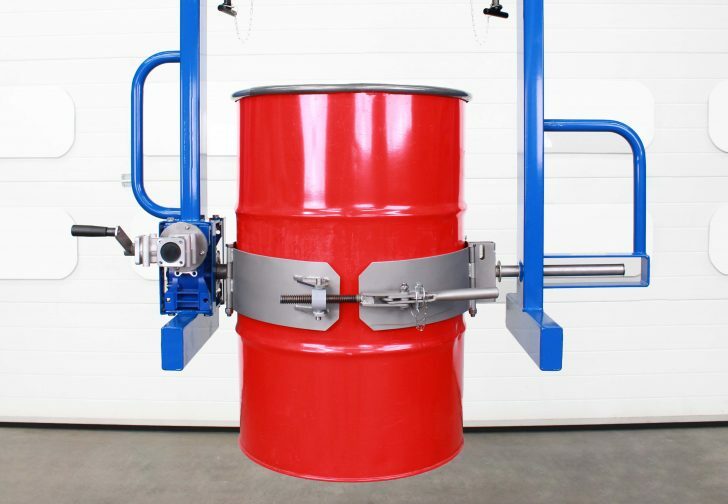 The fast acting over-centre clamp is adjustable to allow drums from 580-600mm in diameter to be clamped (200- to 220-litre drums). Made out of stainless steel and manufactured in the UK, the securing system is extremely durable and robust. 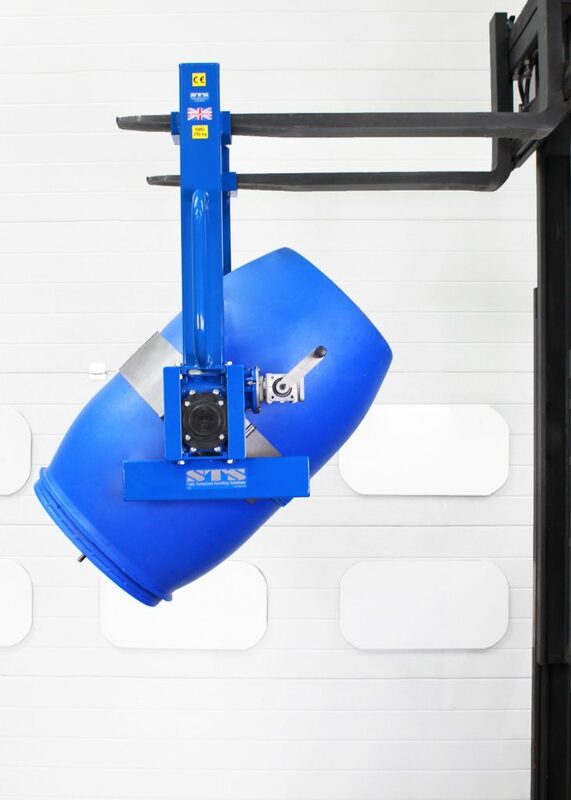 If you handle drums of varying sizes, we also supply an Overhead Drum Rotator, which is designed with a universal band, accommodating drums from as small as 50 litres right up to 220 litres. Our unique rim-locking device attaches to the upper lip of the drum to prevent drum slippage in the band assembly. MAUSER drums and other plastic drums require the use of this device to hold the drums securely. 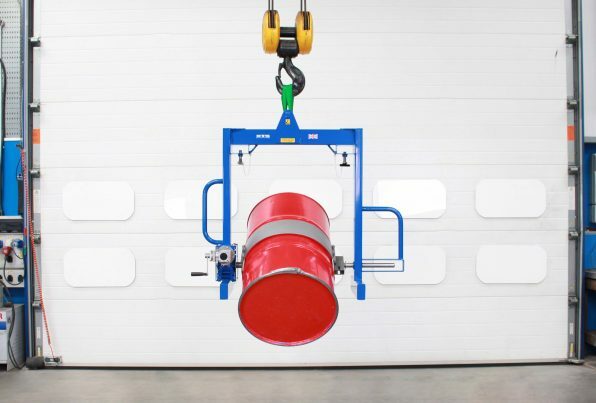 The device is not required when handling 200 litre steel drums as they can be gripped with just the rubber-lined band around the drum circumference. A high-quality self-locking rotational gearbox ensures drums never self-rotate. Operators rotate drums by hand by turning the gearbox input handle. With an ergonomic gearbox ratio of 120:1 it is easy for any operator to decant drums in the workplace. 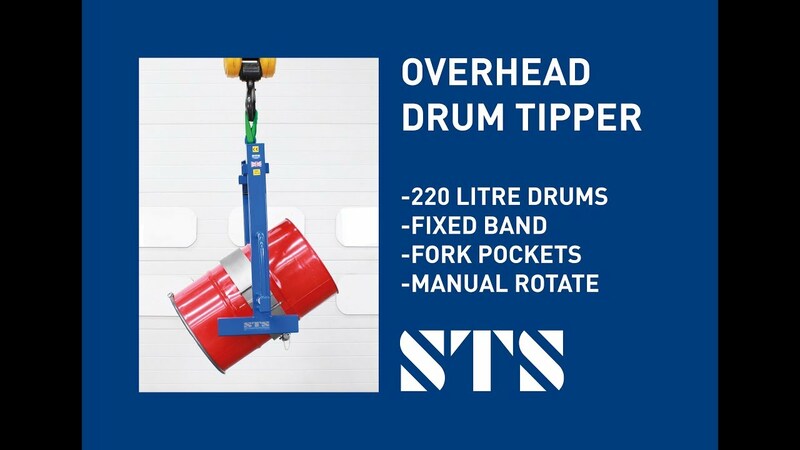 With two distinct pick-up points, the Overhead Drum Rotator (Fixed Band) is a great choice if you need a versatile drum tipper is a great choice if you need a versatile tipper. The large central lifting pin has been designed for use with an overhead crane, derrick or hoist. 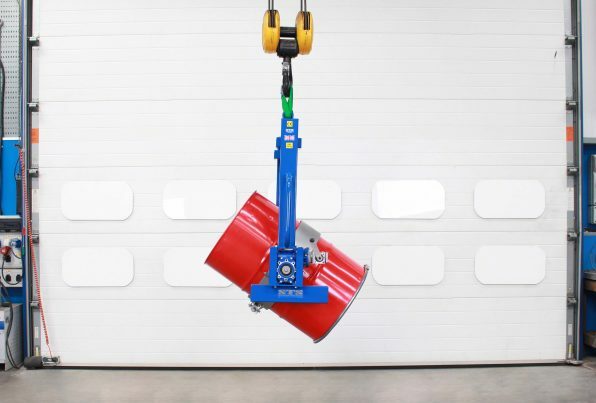 Fork pockets are installed beneath the top beam to allow mounting onto a stacker or forklift truck..
Our Overhead Drum Rotator is suitable with a wide range of drum types, sizes and materials. For a full list of compatible drum types, see the drum suitability document below. 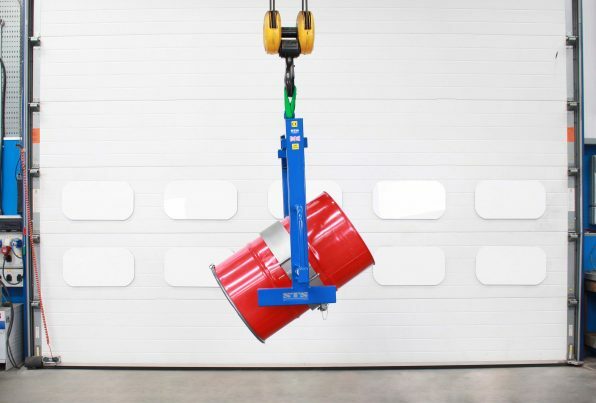 An ATEX-rated overhead drum tipper is available for use in zoned hazardous areas. Our DRU02-FB-SS-Ex is constructed from 304-grade stainless steel, this greatly reduces any thermic-strike risk. This model is suitable for gas and dust areas: Zone 1, 2, 21 and 22. 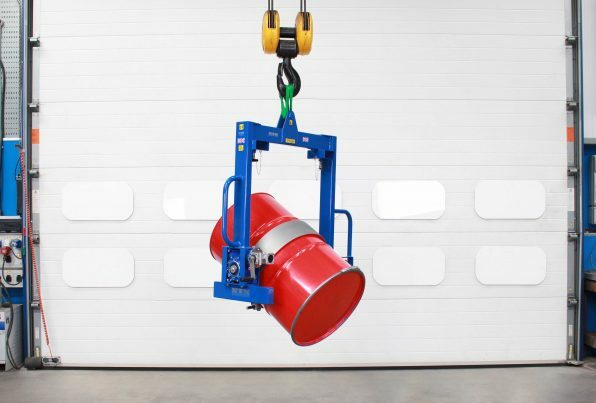 All our ATEX drum handling equipment is supplied with a manufacturer’s EU Declaration of Conformity stating compliance with the ATEX Directive 2014/34/EU. 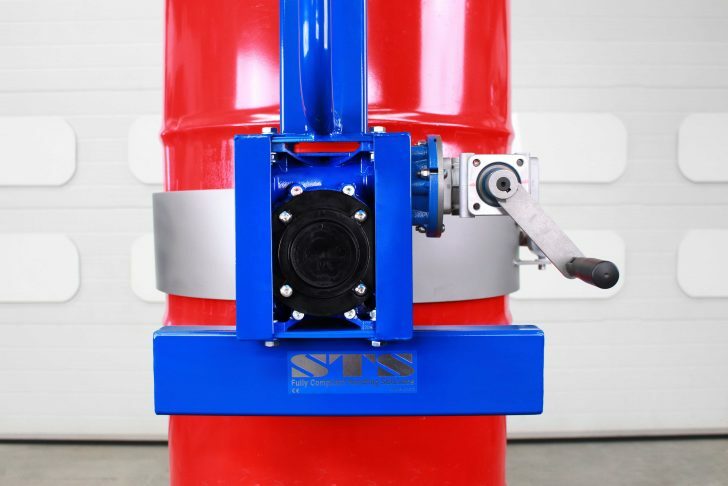 We can provide this model certified for use in an ATEX area - suitable for Zone 1, 2, 21 and 22. We can offer a 304-grade stainless steel unit with a aqua blasted smooth clean finish. These units are suitable for clean rooms and Good Manufacturing Practice (GMP) areas.